Last week our MY Swim to Sport participants, who have been learning how to swim over the past 13 weeks, tried Underwater Hockey at the Hobart Aquatic Centre. 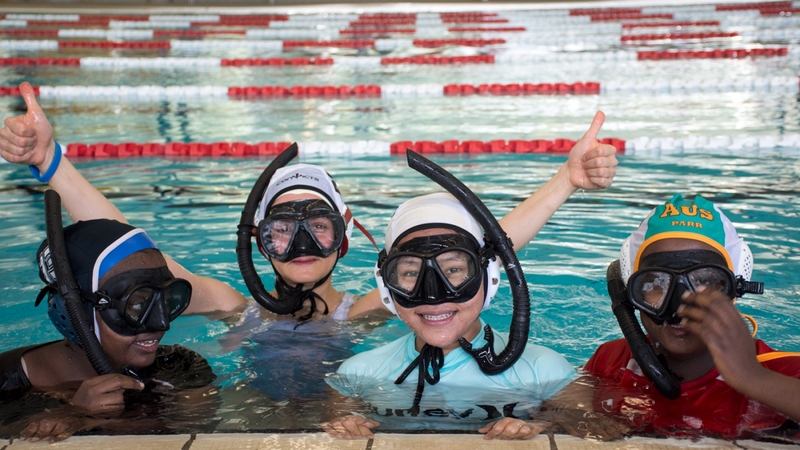 From Zero to Hero swimming instructor Nadia Azizabadi and members of the Tasmanian Underwater Hockey Association (TUHA) taught the group of young people from migrant and refugee backgrounds how to use and swim with masks, flippers and snorkels. For many of the participants it was their first time using the equipment. They found that having a snorkel helped them a lot with their swimming, as they were able to breath more easily. Some participants found the flippers challenging to use, while others enjoyed wearing them as they helped to increase speed. It was fantastic to see the participants having fun in the pool while trying something very new to them. Each week, they show continuous improvement. Next session participants will try scuba diving! The MY Swim to Sport program is funded by the Healthy Tasmania Community Innovations Grants through the Tasmanian Government. ©2018 Migrant Resource Centre Tasmania. All rights reserved.